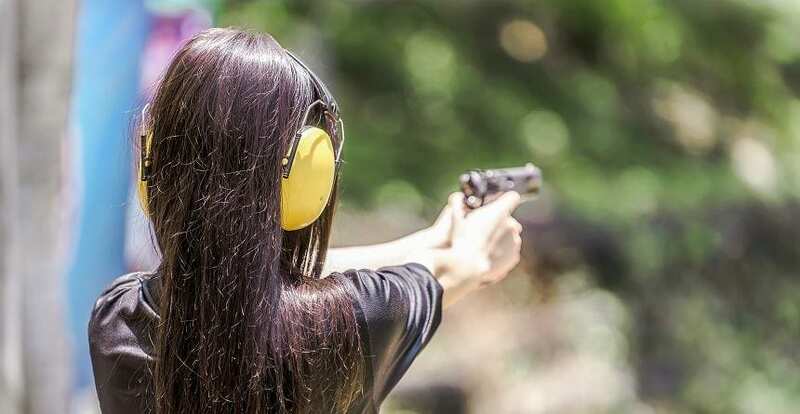 Security for your handgun is paramount, and outside of a bigger safe for all your firearms, a biometric safe can often be the best choice for someone looking to secure their favorite sidearm. 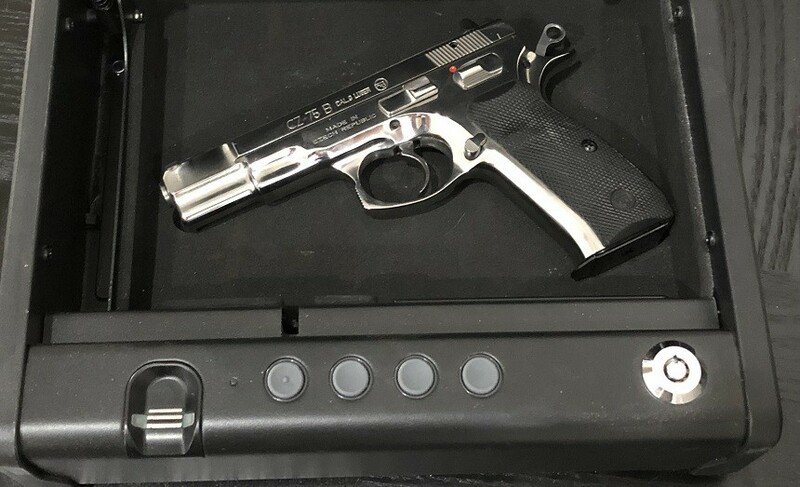 There are many types of smaller safes, but biometric gun safes with fingerprint recognition have become increasingly popular in recent years. Biometric safes do away with the mechanical codes of traditional safes. Instead, they rely on the owner’s biometric data (your fingerprint), to provide quick access when needed. 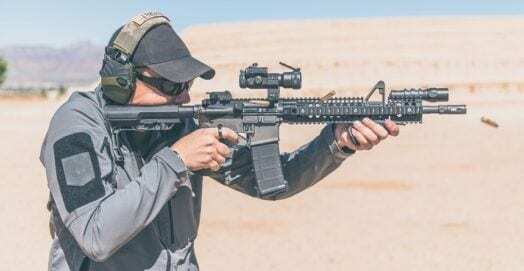 This article will examine the key features to consider when buying a biometric safe for your pistol, followed by a complete breakdown of eight of the best that are currently available on today’s market. Biometric gun safes use the body’s own information as the means of accessing the safe. As such, they do not usually feature mechanical locks that would require the entry of a code, or turning a dial. Some models do have the ability to use a key, or a code – but it’s not the only means of opening the safe. This makes it so that owners don’t have to worry about remembering combinations, as their fingerprints contain all of the information needed to access the safe. Fingerprint recognition allows the owner to register their fingerprints at the time of installation. Some models can register several fingerprints if multiple people need access to the safe. The safe will check the fingerprints of anybody who attempts to access the safe against the registered fingerprint. They are great in panic situations, where you don’t have the ability to remember a combination or find a key when reaching for your handgun. If you try to open the safe with a non registered fingerprint, most models create an alert status that the safe’s owner must disengage with his or her own fingerprint. Poorly-made scanners may fail to spot registered fingerprints, resulting in the owner losing access to the safe. Many scanners will also struggle to identify fingerprints from soiled fingers, or any fingers that have paper cuts. That means it’s vital to research overall quality before making a purchase. Battery operated scanners are popular, but most safes that are powered by battery also have key opening access in the event of a battery failure. There are many quality points to consider when buying a fingerprint recognition style safe. Most biometric gun safes offer similar security features. Lock it up, use your finger when you want to open it and then walk away. With that being said, there are also definitely different technologies that are used with each manufacturer. Before making a purchase, we’ve identified 10 different quality checkpoints that you should consider in during your purchase process. Let’s look at each of them in more detail. Relentless reliability is key, and biometric gun safes must have accurate scanners, else they will fail to identify the user properly. A poorly-made scanner may not read the owner’s fingerprints, resulting in the owner being locked out of the safe. Beyond that, faulty scanners affect the level of security the safe provides. Some low-quality biometric handgun safes may allow unauthorized access, especially if they fail to record fingerprints properly at the time of installation. Buyers should beware of cheap safes, as these may have been made with the lowest-grade parts. A biometric safe offers little comfort if its key security measure malfunctions, so a safe that meets or exceeds current industry standards is the best option. It also pays to research the manufacturer to determine its reputation within the industry. Many biometric gun safes offer owners the option of bolting them to the floor or wall. Professional installers can help with this if the buyer does not feel comfortable doing it themselves. Bolting the safe prevents an intruder from picking up the safe and escaping with it. While most safes are heavy enough to prevent this without bolting, it’s an added security measure that makes many buyers feel more comfortable. But, bolts also prevent the owner from removing the safe in other situations. For example, the safe’s owner will have to go through the unbolting process whenever he or she moves the safe from one place to another. A bolted safe will also have to stay where it is in emergency situations, such as a house fire. A biometric gun safe’s external measurements may not accurately reflect the amount of storage space it has. Remember that safes come in different shapes and sizes. 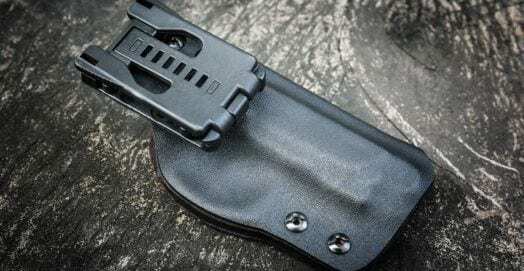 Some provide minimal storage space for small valuables or smaller firearms, whereas others offer large amounts of space for things like larger pistols and holsters. Buyers should consider the items they wish to store in their safes before purchase. Check the dimensions, making sure that these relate to the interior of the safe. Many buyers choose safes that offer slightly more storage space than they need. This is a smart thing to do, and the same principle applies when purchasing other accessories like cases. This offers easier access to the items inside the safe, which can prove crucial in a panic situation. Regardless of the quality of the safe’s fingerprint scanner, there is always the potential for something to go wrong. The scanner may malfunction, or the user could find the safe fails to scan damaged fingers. Beyond that, scanners will stop functioning if their batteries run out. That means the safe should offer some means of alternative access. Many safes come with backup keys that the owner can use to manually override the fingerprint scanner. Others use more modern technology, such as mobile apps, to provide the same function. 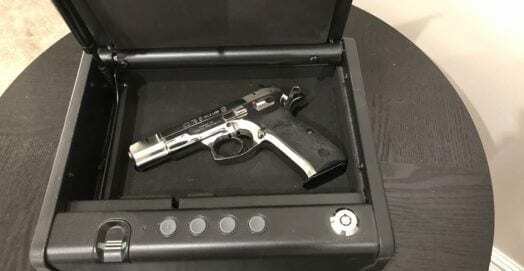 Having alternative access to a biometric gun safe prevents the user from having to call a professional safecracker if something goes wrong. Several organizations in the United States offer approval to biometric gun safe manufacturers. These approvals usually show that the safe can store firearms without any issues. The most prominent of these organizations are the California Department of Justice and the Federal Aviation Administration (FAA). Buyers should look for either organization’s seal of approval on any safes they consider buying. Most safe manufacturers use steel when designing biometric handgun safes, though some opt for aluminum. The thickness of the material reveals how effective it is at blocking outside intrusion. 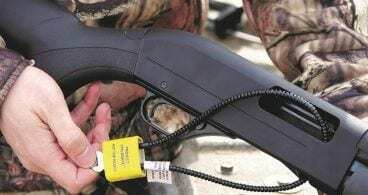 16-gauge steel offers more protection than 8-gauge steel. Beyond that, buyers should examine the safe closely to spot any component issues. In particular, the door should fit snugly into its frame, with no room for any tools an intruder might use to pry the door open. Those are the key features buyer’s should look at when searching for the best fingerprint gun safe. It’s up to the buyer to determine which features are most important to them, as not all safes will have them. Let’s move on to reviewing some of the best biometric gun safes on the market today. We will take a deeper look at the technology, quality, size, capacity and more and compare it across our 8 favorites. SentrySafe’s product offers enough space for a single handgun, and features a biometric lock that uses the owner’s fingerprints to provide access. Beyond that, the safe also uses a combination lock, offering added protection for the firearm stored inside. The keypad makes no noise upon combination entry, ensuring it does not alert intruders when the safe is in use. The small door contains a compression gas strut, which ensures the safe stays quiet upon being opened. This prevents the safe from alerting intruders should the user need to open it during a panic situation. SentrySafe has also built the door using 12-gauge solid steel, and has implemented pry-resistant measures to ensure no outside access. The door opens quickly once the safe grants access, taking approximately one second to open fully. It also stays open, rather than swinging back shut. This allows for single-handed access, so a user can open the safe while calling for help using a cellphone. The small compartment inside the safe offers easy access to a firearm, especially for smaller calibers like the 22. The safe itself also meets the requirements that the California Department of Justice has in place in regards to safe quality. Buyers receive an override key that they can use to open the safe should the scanner malfunction. Users should store this key in a safe location, as it could also provide access to intruders. Further, the safe has small holes on its undercarriage, which buyers can use to bolt the safe into place on a floor or shelf. Users can also mount the safe to a wall using these holds, with many choosing to mount the safe above their beds to provide easy access during panic situations. Having said that, SentrySafe has not designed this safe specifically as a wall-mounted product. Buyers receive a one-year manufacturer’s warranty with the product, which covers any mechanical or structural issues that arise due to poor workmanship or faulty materials. In our opinion, it’s the best overall value for your hard earned cash. Gunvault claims to have developed a revolutionary safe design with its SpeedVault SVB500. The safe uses a biometric finger scanner and activation button to provide access. Upon activation, the safe drops down a drawer where the user can place a handgun. This drawer also provides quick access when the user needs to take the gun out of the safe. The gun points holster-up when in the safe, meaning the user can draw the firearm out and have it ready to use straight after opening the safe. The safe can retain a maximum of 120 fingerprints, so several users can access the safe at any one time. This allows 12 people to register all ten of their fingerprints, so they can access the firearm inside the safe in any situation. The 18-gauge steel construction offers plenty of protection from outside forces. The safe also comes with foam padding on the inside, which will protect the contents when not in use. Gunvault claims the safe uses such precise fittings that it is virtually impossible to pry the door open with regular hand tools. This means that only those with fingerprint access can get to the gun inside the safe. The user can mount the safe anywhere, making it one of the more versatile biometric handgun safes available. 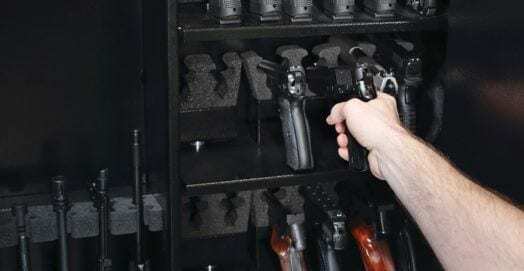 Gunvault also notes that the user can mount the safe in any direction, so the user can choose the exact mounting configuration that suits them. The safe carries no water or fire rating, so it may not be the best fingerprint gun safe for those living in areas prone to flooding or fire. There is no warranty as standard with the safe, but users can get one if they contact Gunvault using the company’s customer service number. Warranty – None provided, though customers can contact Gunvault to arrange one. 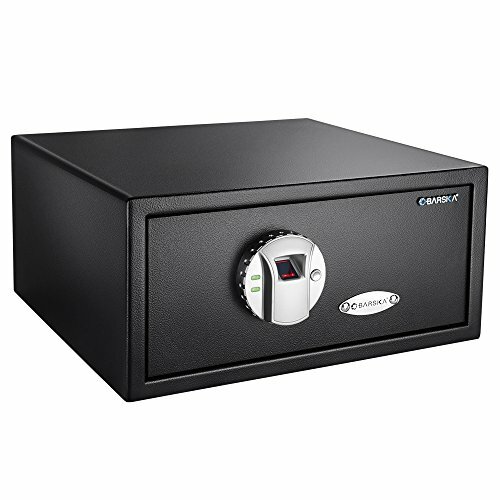 Viking Security Safe’s VS-25BL biometric gun safe comes with a carpeted interior, which offers more protection than most to the valuables placed inside. Imported from outside the United States, the safe will not scratch any jewelry or firearms placed inside. The safe uses a 500 Dots per Inch (DPI) fingerprint scanner, which can register all parts of the user’s fingerprint. This keeps accuracy issues to a minimum, ensuring the user does not have to worry about faulty reads during panic situations. It also comes with a keypad, which has an LCD screen above it that shows the user how much battery life the safe has left. Users can program codes between four and eight digits long using the keypad. Made using steel, the safe can hold up to 32 fingerprints. It stores these in a non-volatile memory unit, which ensures the safe retains previously registered fingerprints should the batteries run out. The door itself is 5 millimeters thick, and will open in less than one second once the safe grants access to the user. This makes it ideal for panic situations, where quick access is a priority. The safe also emits warning beeps when the user leaves the door unlocked for over one minute. The dual motorized deadbolts provide added security, as too do the anti-pry insertion slots found on the door. These prevent intruders from using handheld tools to pry the door open using the deadbolts. Viking Security Safe has used laser cutting technology to build each component, ensuring they all slot together to create an impenetrable safe. 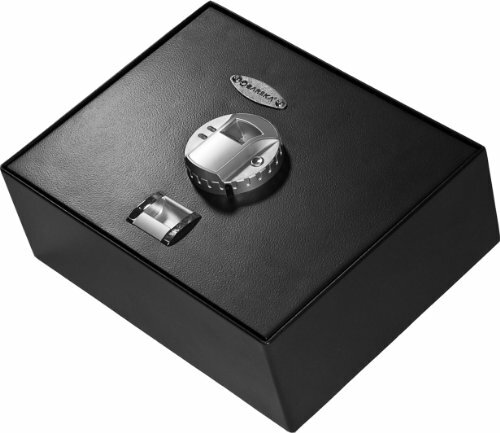 Unlike many biometric handgun safes, the VS-25BL incorporates sound into the package. Users can toggle the sound on or off using the keypad. Upon opening, the safe turns its interior light on so the user can see exactly what he or she is doing. The VS-25BL’s exterior includes pre-drilled holes for use when mounting the safe. Users can mount the safe to the floor or a wall. The safe comes with no fire or waterproof certification. However, it does include a one-year limited manufacturer’s warranty, which covers faulty construction. It also comes with a manual override key, which the owner can use if the fingerprint scanner malfunctions. The VT20i immediately stands out with its impressive design. It will look sleek and stylish in any room. That design does not come at the cost of practicality, though. The safe offers everything a user may expect from a high-quality biometric gun safe. 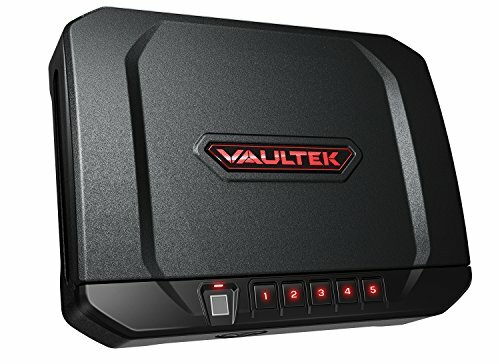 VAULTEK have upgraded their previous anti-theft security measures to make this safe one of the most secure biometric pistol safes around. The anti-pry bars and anti-impact latches prevent anybody from accessing the safe from the outside using handheld tools. The safe also boasts interior hinges, so an intruder won’t be able to use a screwdriver to remove the door. All of these security features combine with a set of internal security brackets, making the safe just as rugged on the inside as it is on the outside. The biometric scanner detects fingerprints quickly, and is capable of storing up to 20 individual prints. Once activated, the safe’s door pens quickly to provide almost immediate access to any valuables stored inside. 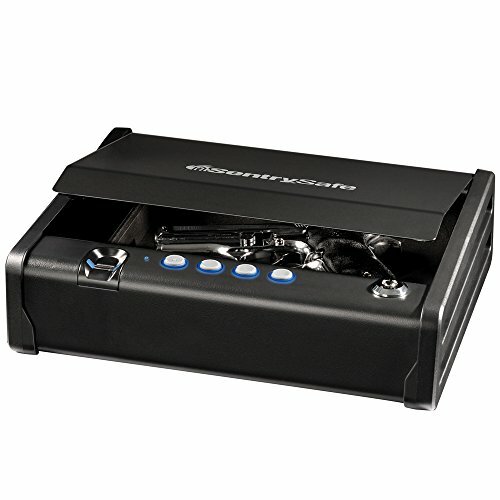 Unlike many other biometric handgun safes, the VT20i comes with a rechargeable lithium battery. Users can charge this battery using the micro-USB kit included in the package, with charging itself taking 2.5 hours. Once charged, the batter will last for four months. 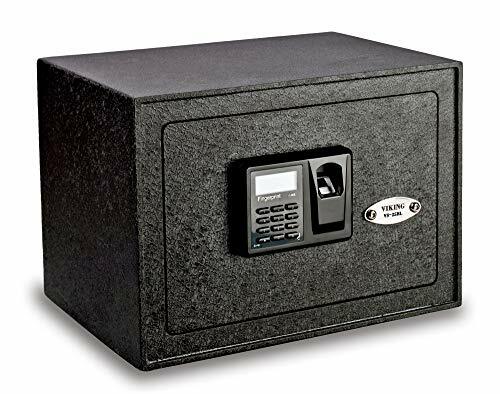 VAULTEK has used 16-gauge carbon steel to build the safe, which it protects with a powder coat finish that protects the safe from corrosive substances. The safe also makes use of modern technology more effectively than many of its competitors. Purchase provides the user with access to the VAULTEK Bluetooth App, which they can use to check the safe’s battery status and adjust the interior lighting settings. The app also provides a backup override function, as it can open the safe remotely. The safe meets the California Department of Justice’s 2017 regulations, marking it out as one of the safest biometric pistol safes around. It also comes with mounting holes attached, so users can bolt it to the wall or floor. VAULTEK provides the mounting equipment needed to do this. VAULTEK’s VT20i series does not include water or fireproofing. However, it comes with a one-year limited manufacturer’s warranty, which protects against any manufacturing defects. Despite its basic appearance, the Barska Biometric Gun Safe offers stellar protection against outside intrusion. A single-shelf safe, it packs plenty of depth. 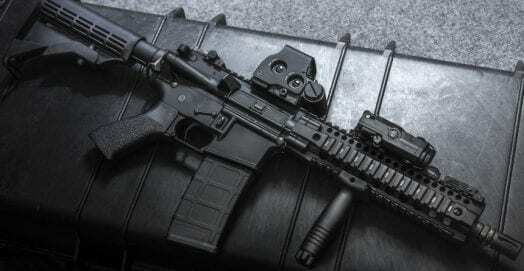 This means owners can use it to store valuables, such as jewelry, as well as firearms. This added space also makes ammo storage easy. Many users find that they can store their handguns alongside several boxes of ammo using this biometric handgun safe. 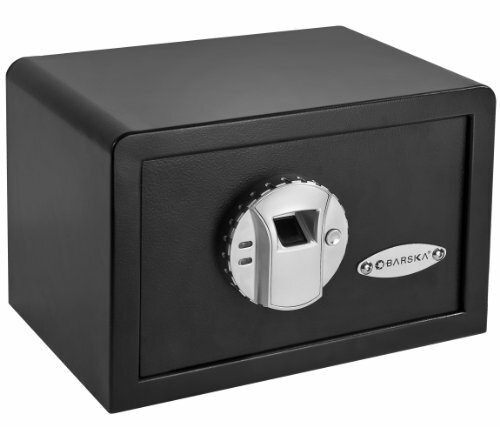 Barska has used several materials to build the safe, and it is imported from outside the United States. Unfortunately, the safe is one of the slowest to open on this list. It will take approximately three seconds from the moment of fingerprint scanning for the door to open. The safe’s biometric scanner is battery-operated. Once the battery starts running low, the safe will emit a beeping noise to alert the owner. Users can still access the safe if the battery dies, as it comes with two backup manual override keys. But, the user needs to unscrew a small flap to access the keyhole, which may not be ideal in panic situations. Still, this flap does add an extra layer of protection that may prevent an intruder from using the keys to access the safe. The scanner itself can store a maximum of 30 fingerprints, making the safe ideal for households with multiple occupants who need access to the safe. The scanner works well, as long as the user follows the detailed instructions included with the safe. Barska has also pre-drilled holes into the safe’s exterior, which owners can use to mount the safe onto the floor or wall. Some may choose to mount the safe in their vehicles, though its size makes this difficult in regular cars. The safe also comes with bolts for mounting purpose. The safe beeps upon opening, but this can be turned off. However, it will also beep if the owner leaves the safe open for more than five minutes. This will not stop until the user closes the safe’s door again. Barska provides a 12-month limited manufacturer’s warranty that protects this biometric pistol safe from manufacturing defects. Unfortunately, the safe offers no protection against water or fire damage. Barska returns with another cost-effective choice. This safe differs from the previous one on the list because it features a top-opening design, which makes it ideal for use as an imbedded floor safe. The safe shares many of the same features as the previous Barska biometric gun safe. The scanner can store up to 30 fingerprints, which should be more than enough to cover the amount of people in the average household. It also comes with pre-drilled holes for mounting on a floor or shelf. The package also includes all of the hardware needed to mount the safe. However, the top-opening design makes shelf mounting inconvenient, as the user will need to reach over the top of the safe to get to whatever is inside. The safe comes with a motorized deadbolt lock, and two steel locking bolts, which provide plenty of protection for its contents. These bolts may make a small amount of noise when opening the safe, but this is fairly minimal. Beyond that, the safe features a floor mat, which protects any valuables that may otherwise be damaged due to contact with the metal interior. It also comes with two AA batteries that will last approximately two years. Please note that this time may vary depending on how often the safe is used. Users don’t need to worry about drained batteries preventing access to the safe. In addition to a beeping system, which lets the user know if the batteries need replacing, the safe comes with a pair of manual override keys. These provide easy access in case the scanner malfunctions, or the batteries run out. Barska includes a detailed user manual with the safe, which covers any issues users may have in regards to its installation or use. It is important to keep the fingerprint scanner clean, so it’s advised to use a dry cloth to wipe it down after every use. Barska also recommends checking the scanner every six months to confirm that it still reads the registered fingerprints. The safe is not waterproof or fireproof but it is of sturdy construction and also comes with a one-year limited warranty. This protects against any manufacturing defects. 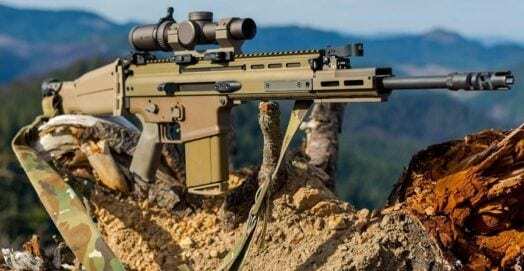 The GunBox 2.0 stands out as it is the only safe on this list that has Federal Aviation Administration (FAA) approval. This means the owner can install the safe in a vehicle, protected by the knowledge that it has been tested as a safe means to protect a firearm during transport. It also includes the widest range of options for opening. Alongside fingerprint recognition, the safe recognizes input from a Bluetooth app and several accessories that come packaged with the safe. These include two Radio-frequency identification (RFID) keycards and a pair of fobs. The app, which is downloadable from iTunes and Google Play, has several other functions too. 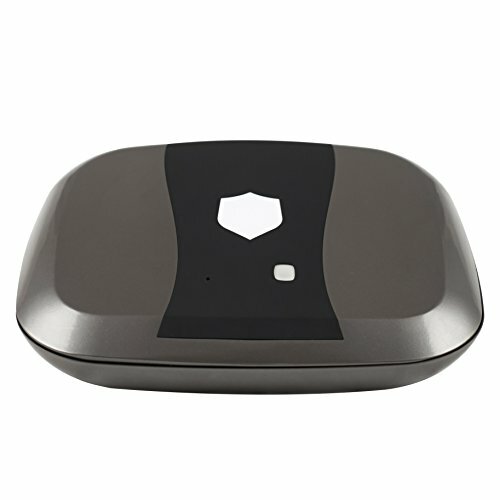 It can be used to set up additional fingerprint recognition when the user is away from the safe. Beyond that, it registers any additional fobs or keycards the user buys. Beyond that, the app allows the user to tinker with the safe’s internal light settings and adjust the sensitivity of the fingerprint scanner. It’s best to secure this box in one spot, as it has a tamper alarm. The alarm activates whenever somebody moves or bumps the GunBox 2.0, instantly alerting the user if an intruder tries to break into the safe. Users can change the tone and volume of the alarm using the app. The fingerprint scanner can recognize a maximum of 100 fingerprints, so ten people could register every digit if desired. The safe features industry-leading biometric technology, so users should find no issues arising due to a faulty scanner. Mounting doesn’t present any problems as the GunBox 2.0 comes with pre-installed holes for mounting on any surface. 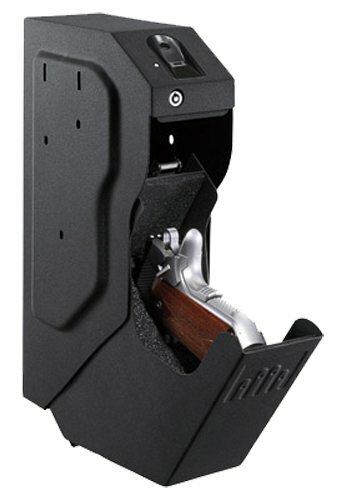 The owner can even choose the orientation, making this one of the most flexible biometric handgun safes on the market. The safe comes with two USB ports, which can be used to charge phones and other devices. All told, the internal battery lasts for approximately 18 months, though this may vary depending on how often the safe is used to charge other devices. The GunBox 2.0 comes with a one-year warranty, starting from the shipping date. Much like the other safes on this list, it does not come with water or fireproofing features. Barska rounds out the list with another great option. A smaller safe than the rest of the Barska products, this safe still has many of the same features that have made Barska a leading brand of safe manufacturers. In fact, the safe’s smaller stature can offer additional peace of mind to the user. It can be stored almost anywhere, which means the user can keep the safe out of the hands of any children who might try to tamper with it. 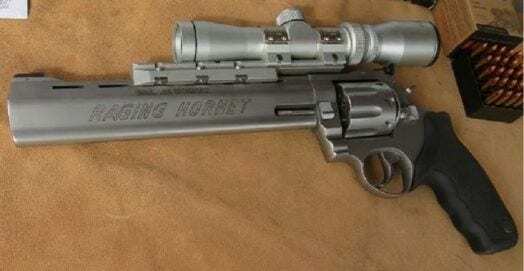 This also makes the safe easy to conceal. It comes with pre-drilled holes, which allow for mounting on walls and shelves. Installation is a breeze, so most people won’t have to call professionals to get the safe mounted. Barska has used several materials to build this safe, with the steel body ensuring it offers protection against any outside intrusion. The company bolsters this protection with a pair of steel locking bolts, which keep the door wedged shut when the safe is not in use. Of course, the biometric fingerprint scanner offers even more protection. Capable of holding up to 30 fingerprints, the scanner ensures only those with access to the safe can open it. The safe also comes with two backup keys, which can be used to open the safe if something goes wrong with the scanner. Barska protects the keyhole with a small flap, which requires a screwdriver for removal. The safe offers fast access with one touch of a registered finger, plus the user can activate the silent access feature to ensure no intruders hear the safe opening. 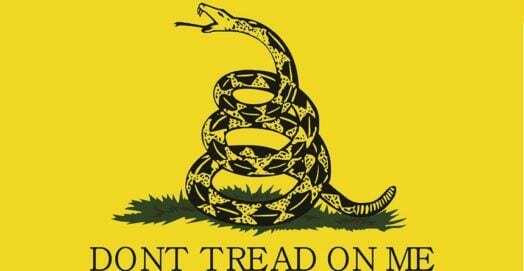 Furthermore, the safe carries approval from the California Department of Justice for use with firearms. 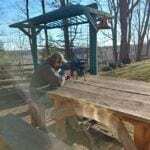 Users can feel safe in the knowledge that nothing untoward will happen to their firearms while they’re in storage. Barska offers a one-year limited manufacturer’s warranty. Unfortunately, the safe will not protect its contents from water or fire damage. Each safe we’ve looked at comes with an array of features beyond fingerprint recognition, with the most impressive being capable of recognizing input from mobile apps as well as the user. In choosing the best biometric gun safe for your money, it’s important to look at how much value each safe offers in return for the cost. When all is said and done, the SentrySafe biometric safe is probably our favorite purely due to the fact it’s been mass produced and most of the kinks have been worked out over time. It’s also an extremely good value for the money, and it’s what our managing editor trusts his CZ 75 9mm pistol with. The SentrySafe biometric safe is a great pick for any handgun enthusiast, just due to the fact that it can be easily mounted through the mounting holes at the bottom of the safe, and has 3 different entry routes between the fingerprint pad, digital code or panic key entry. While we are fans of the SentrySafe, any one of the picks you’ve read about here will get the job done.